What’s the one question any quality leader asks his team? All military leaders are responsible for mentoring the Soldiers under their command. Similarly, a father is responsible for raising quality children. Responsible to help them discover the best version of themselves and to do their best at everything. Soldiers and children need to answer one question before they can call a task complete under my command. I hate to admit it, but sometimes Soldiers have the same attitudes as my kids when they’ve just been asked to clean their room. They avoid their responsibility like the plague. It is difficult to encourage Soldiers in between Drills in the National Guard. Especially when it comes to staying physical fit for demands military life. Soldiers in the National Guard must pass the same Army Physical Fitness Test as full-time Soldiers. As Citizen-Soldiers, the responsibility falls on individuals to take initiative and stay fit. All Soldiers must score at least 60 points in each event consisting of push-ups, sit-ups, and a 2-mile run in order to be considered physically ready to deploy. The finish line of a 2-mile run is a place of victory or defeat. For some Soldiers, the run is easy. For others, they would rather die than run two miles. No matter how they feel about the run, I always have one question at the end. If a Soldier puts every last bit of energy into completing their run and barely meets the standard, they deserve some recognition. They need to see how we respect their effort. They need our encouragement to keep excelling. But when they only half-heartedly run (pass or fail), we need to hold them accountable with this same question. Failure due to lack of will, tiny-heart-syndrome, or just plain laziness is not tolerable. The Soldier who is capable of running two miles in less than 14:00 minutes who decides to run 16:00 minutes instead is in the same situation. They must answer the question, “Is that the best you can do?” Leaders must hold their teams accountable for improvement. As dads, we face similar situations with our kids. We have high expectations and standards. Sometimes too high. 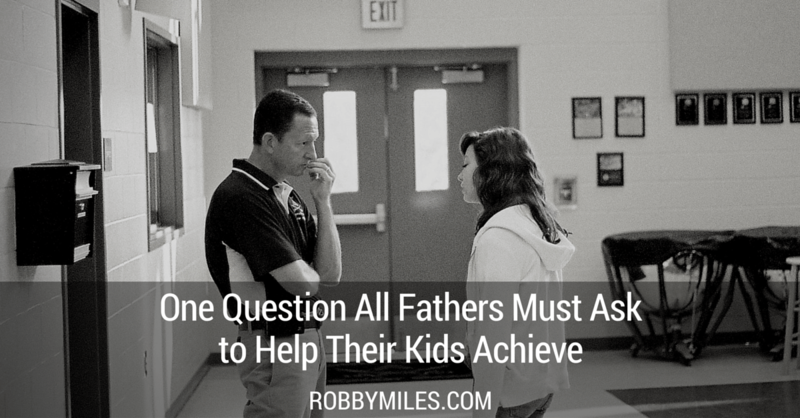 It’s our job to look at our kids and ask, “Is that the best you can do?” We need to accept our kids when they give it their all, but hold them accountable when they slack off. If your kids cannot honestly answer that they gave their best, you’ve got your work cut out for you. It’s your job as a leader in your home to give them purpose, direction, and motivation. Give them a reason to strive for more. Show them how they can achieve greatness. Be there to encourage them and help them be successful. Look in the mirror and ask yourself, “Is this the best I can do? Learn the secrets of using Nozbe as the center of your digital productivity system. Awesome. You're in! Now check your email to confirm your subscription and I'll send you 15 Apps You Need for Simple Productivity! I want to be a Nozbe Ninja! Director of Customer Experience, Michael Hyatt & Co.